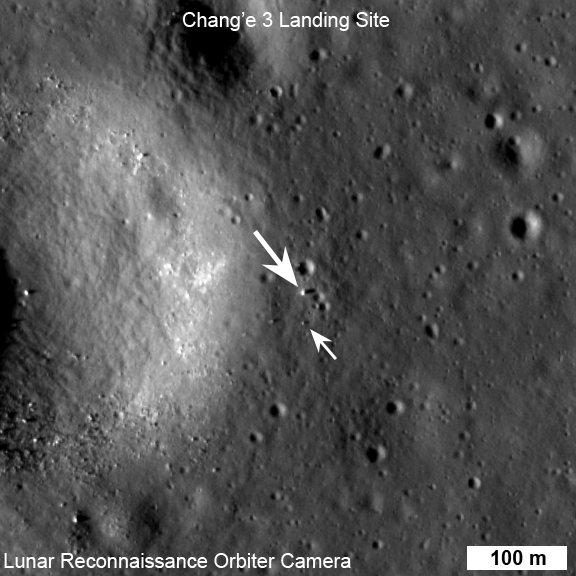 Chang’e 3 lander panorama [Images from CNSA; compiled by Di Lorenzo and Kremer] showing Yutu shortly after it drove down the ramp to the surface. Chang’e 3 landed on Mare Imbrium (Sea of Rains) just east of a 450 m diameter impact crater on 14 December 2013. Soon after landing, a small rover named Yutu (or Jade Rabbit in English) was deployed and took its first tentative drive onto the airless regolith. At the time of the landing LRO’s orbit was far from the landing site so images of the landing were not possible. Ten days later on 24 December, LRO approached the landing site, and LROC was able to acquire a series of six LROC Narrow Angle Camera (NAC) image pairs during the next 36 hours (19 orbits). The highest resolution image was possible when LRO was nearly overhead on 25 December 03:52:49 UT (24 December 22:52:49 EST). At this time LRO was at an altitude of ~150 km above the site, and the pixel size was 150 cm. LROC NAC view of the Chang’e 3 lander (large arrow) and rover (small arrow) just before sunset on their first day of lunar exploration. LROC NAC M1142582775R, image width 576 m, north is up [NASA/GSFC/Arizona State University]. The rover is only about 150 cm wide, yet it shows up in the NAC images for two reasons: the solar panels are very effective at reflecting light so the rover shows up as two bright pixels, and the Sun is setting thus the rover casts a distinct shadow (as does the lander). Since the rover is close to the size of a pixel, how can we be sure we are seeing the rover and not a comparably sized boulder? Fortuitously, the NAC acquired a “before” image (M1127248516R) of the landing site, with nearly identical lighting, on 30 June 2013. By comparing the before and after landing site images, the LROC team confirmed the position of the lander and rover, and derived accurate map coordinates for the lander (44.1214°N, 340.4884°E, -2640 meters elevation). LROC NAC before and after images of the Chang’e 3 landing site [NASA/GSFC/Arizona State University]. The lander set down about 60 meters east of the rim of a 450 meter diameter impact crater (40 meters deep) on a thick deposit of volcanic materials. A large scale wrinkle ridge (~100 km long, 10 km wide) cuts across the area and was formed as tectonic stress caused the volcanic layers to buckle and break along faults. 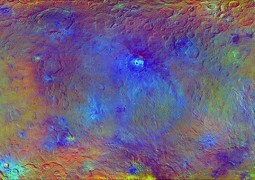 Wrinkle ridges are common on the Moon, Mercury and Mars. Lunar samples, and to some extent meteorites, have provided a benchmark for understanding the processes and products of space weathering.